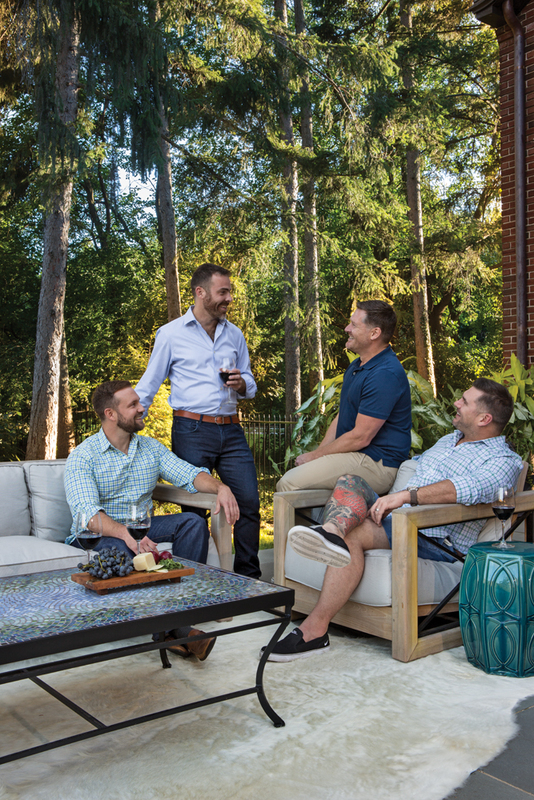 When Boyd Richards and Josh Ronnebaum initially came across the stately Lucerne Drive home in Palmer Woods, it was love at first sight. Richards, a neurosurgeon, and Ronnebaum, an attorney, sought what one might call a “forever” home. It had to feel like a comfortable getaway from their busy careers. It had to function as a place to entertain guests anytime. And it had to be inviting enough to serve as a “hotel” when their extended families came to visit. 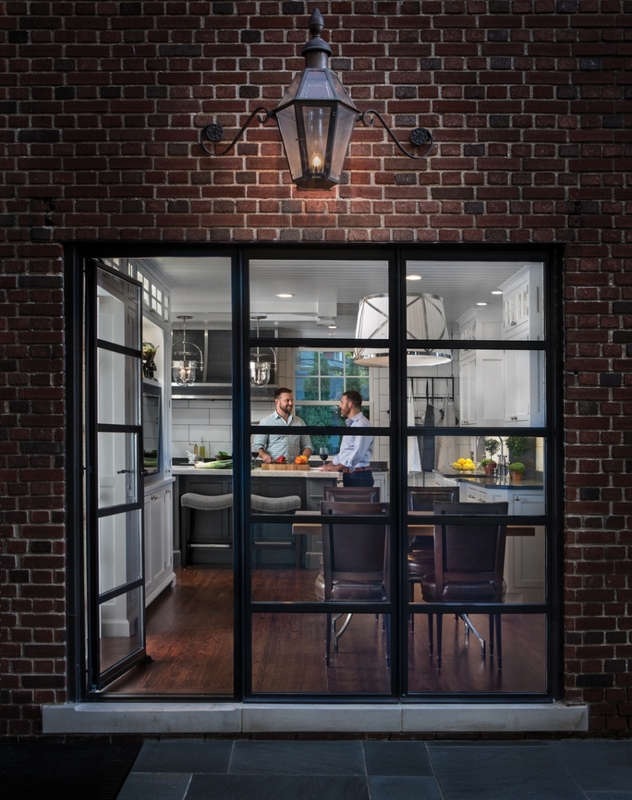 “From the very beginning, the home evoked in us a great deal of passion,” says Ronnebaum. “Our goal was to equip it with all the modern comforts while honoring the beauty and grandeur that was inherent in the original design.” And what an original design. In 1915, a developer named Charles W. Burton purchased 188 acres from the Palmer Estate to create Palmer Woods, the first subdivision platted in Michigan. Renowned landscape architect Ossian Cole Simonds designed a layout where every lot had a unique shape and the streets gently curved. Most Palmer Woods home were constructed between 1917 and 1929 and almost all still exist, including the one purchased by Richards and Ronnebaum. 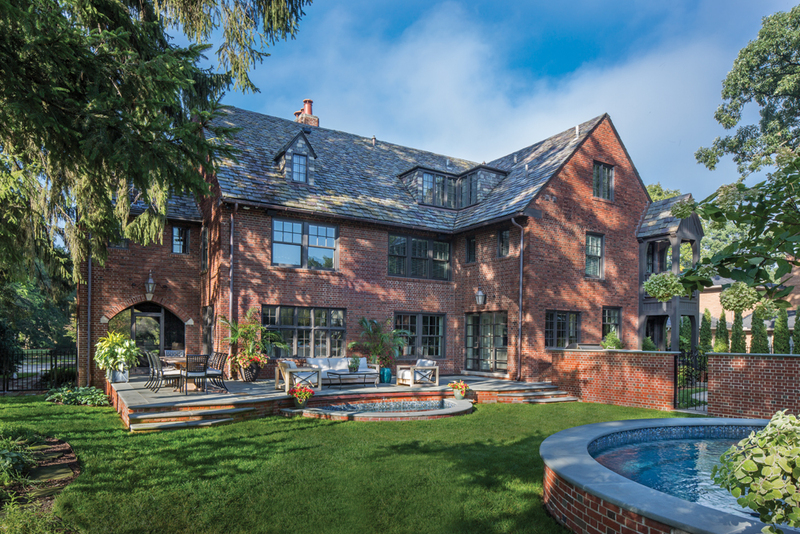 They are just the fifth owners of this elegant 6,300-square-foot red brick Tudor. Designed by architect Alvin E. Harley, the home was built in 1923 for Charles Albert Lindsey, owner of C.A. Lindsey Co., which sold silk automotive interiors. Later it became the home of Lindsey’s son-in-law, Robert Pauli Scherer, inventor of the rotary die encapsulation machine that fundamentally changed the production of soft gelatin capsules. In 1949, King David Shwayder — the son of the founder of the Shwayder Trunk Manufacturing Company, later known as the Samsonite Corporation — bought the home. Richards and Ronnebaum purchased the home in 2013 from Ron Quintero, who had lived there since 1961. 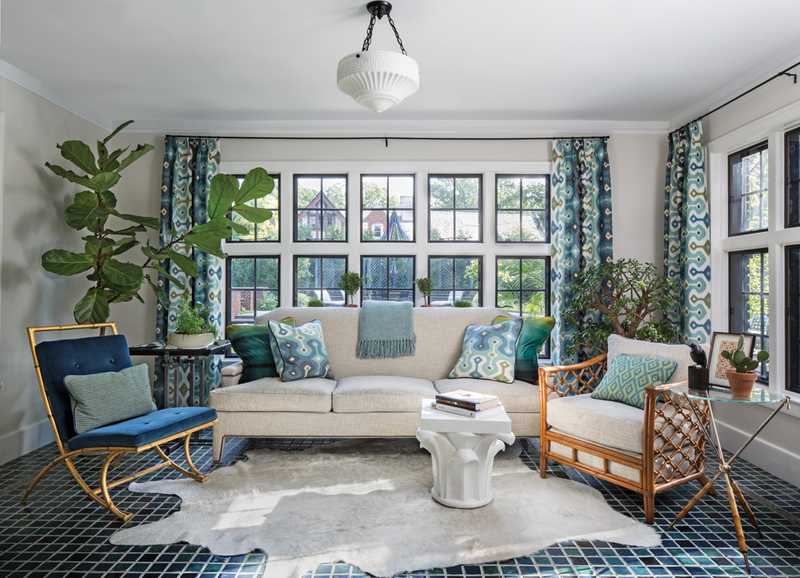 Finding the right design team was a slam dunk because the couple had long admired the work of Arturo Sanchez and Barry Harrison, principals of Art|Harrison Interiors in Royal Oak. Outside, the couple decided to create what they call their History Walkway. Composed of brick, limestone, and bluestone fragments recovered during the renovation, it begins at the driveway and ends at the gate to the backyard. The backyard is a focal point for summer parties. To accomplish their vision, they worked with Deborah Silver of Detroit Garden Works in Sylvan Lake and a stone contractor. Silver also designed a unique built-in brick-walled circular pool that is 20 feet in diameter and 5 and a half feet deep. The jets placed around the perimeter are designed to create a fountain when desired. And a custom galvanized iron pergola, designed by Silver to echo the arc of the pool and constructed by Branch Studio, has been placed just beyond. Last year the garden was part of The Garden Cruise, a ticketed event that benefits The Greening of Detroit. A recently completed greenhouse, made out of energy-efficient glass, adds to the backyard’s functionality. Depending on the season, the couple plans to push out the subtropical plants and palms outside so they can host small dinner parties. Energy efficiency was key to updating the 1920s structure. That included new insulation, heating, cooling, plumbing, and electrical, plus mostly new windows and storm windows, all LED lighting, tankless water heaters, and air conditioning. The meticulous 18-month restoration included grinding the surface of the green and white marble floor in the entry hall to make it perfectly smooth. Originally made of terra cotta, it had been replaced with large slabs of travertine marble in the 1950s. “While doing the renovation, we were able to recover four of the original segments. Then, replicating the design we found on the original segments, we had the current surround carved out of solid limestone by Autumn Fisher, an amazing local stone mason,” Ronnebaum says. The kitchen, formerly three separate rooms (a small square room, a butler’s pantry, and a breakfast area) is now one large space whose walls are clad with huge shiny white subway tiles. The natural steel hood over the range was crafted by Patra and Patra in Royal Oak. The white wooden cabinets were made by Ayr, a company in Indiana. And the 7- foot-by-3-foot island sports a huge countertop made from Cristallo, a quartzite quarried in Brazil that is more durable than granite. In the breakfast area, the handsome planked walnut table and free-standing upholstered banquette were custom-made by Harrison and Sanchez. In the formal dining room, an oval-shaped Louis XVI-style mid-century Jansen-style mahogany table, purchased on the internet “for a song” from an auction house, dominates the room whose walls are lined with Acanthus Stripe wallpaper from Schumacher. The room’s impressive chandelier, composed of rock crystal, brass, and iron, was also custom-crafted by Harrison and Sanchez. A charming oil painting of a woman by Detroit artist Tony Roko, a former Ford Motor Co. worker, graces one wall because, “I feel like she’s the 1920s lady who would have lived here,” Richards says. For the first-floor library, the couple decided to panel the room’s walls, then paint them in a peacock blue hue. “Originally every bathroom in the house was that color and we really loved it,” Richards says. “We also upholstered the love seat with leather in that same wonderful color. In fact, the library’s original ornate high relief plaster ceiling is yet another element that sold us on the home,” Richards says. And just beyond the piano, a bay window, composed of floor-to-ceiling leaded glass windows, adds architectural interest to the room. On the second floor, the existing master bedroom and bathroom and a nearby nursery and bathroom were combined to create a master suite. It has a huge walk-in closet and a bathroom. 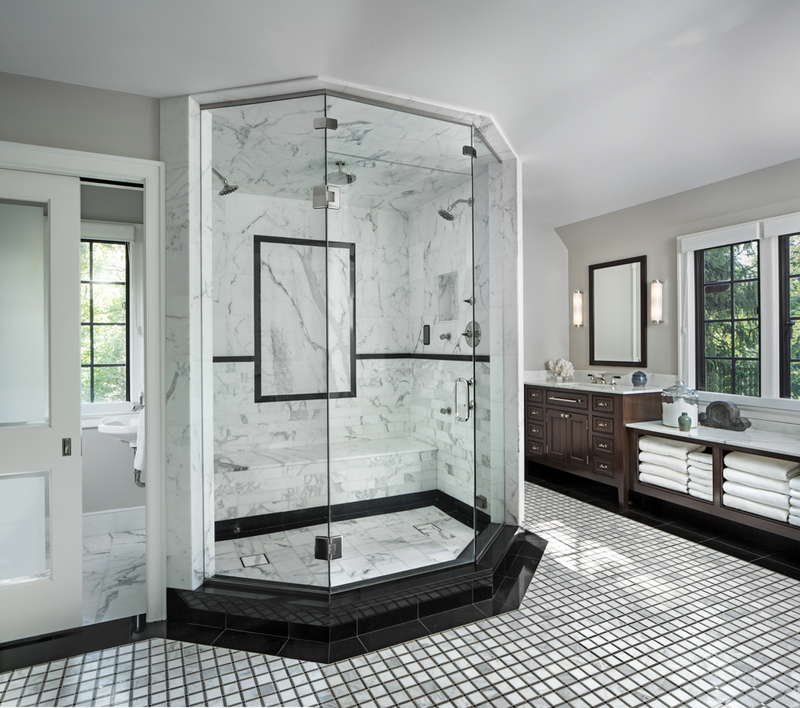 Its rock star-worthy glass-enclosed shower of heavily veined Calcutta marble accented in black Absolute granite, has dual shower heads (each with its own thermostatic control), full body sprays, a heated floor, and a huge heated seat. “You can lie on it to get a steam shower. It’s like a car wash,” Ronnebaum says. A spiral staircase, located in the walk-in closet, leads up to the attic. “I love the attic because it’s so different from the rest of the house and it’s where I like to relax,” Ronnebaum says. Designed with their three nephews and six nieces in mind, the space includes a trundle-bedded sleeping area as well as a living area. The electrical panel from the old house has been made into a coffee table. And the metal desk that Boyd bought when he began his residency holds pride of place. There is also a charming Japanese-oriented niche created by Ronnebaum. “It is furnished with tatami mats, a traditional Tansu chest of drawers and collectibles that I purchased all over Japan when I lived there for four years,” he says. But it’s here in Detroit that they want to stay.